TRAVERSING THE LAND OF BUDDHA - Ghumakkar - Inspiring travel experiences. When you yearn to start anything new, you develop a kind of inkling that you are becoming a part of that thing. Similarly, when you plan to traverse the land of Buddha, you start inculcating a sense of being a kind of Buddha in you. Suddenly a different type of serenity and piousness, calm, and sense of discovering yourself develop in you. 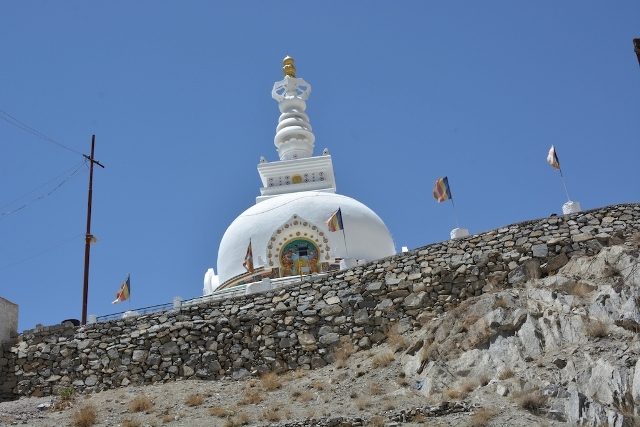 And this is a kind of mystic change in you which drives you to visit Ladakh, the land of Buddha. All of it happened suddenly and we planned a road trip to Ladakh, the land of Buddha. All the road exigencies and preparedness for any untoward happenings were addressed by visiting travelogues and youtube videos. Though, initially, out of sheer enthusiasm, there were four youngsters in the group (yes, of course, me too—an old youngster), for an exciting road journey via Manali route, but alas, at the end nearing the date, the number shrunk to two of us, father and son. My wife did not show any enthusiasm to be a part of the group as it was going to be an adventurous trip and she chose to remain at home for taking care of ‘Oreo’ (our Labra). 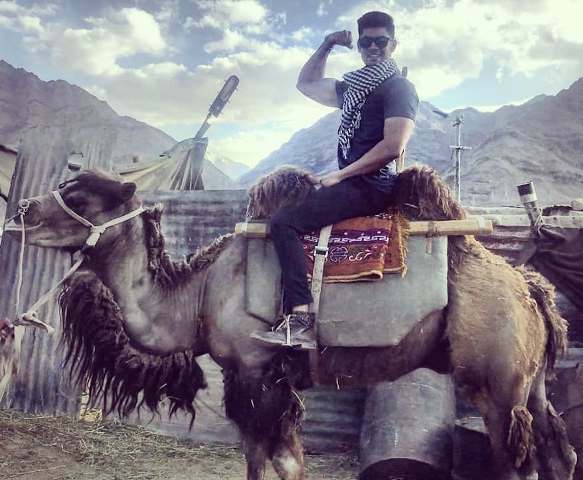 As two of us appeared to be bent upon to go to Ladakh at any cost, suddenly, an unexpected and curious wanderer showed a grand interest in travelling with us. It was my lovely daughter, whom we had earlier overlooked in counting the visitors while fixing up for a road trip. At last, we ended with a number of visitors to only three and we gave up the idea of the road journey and decided to fly to Leh. 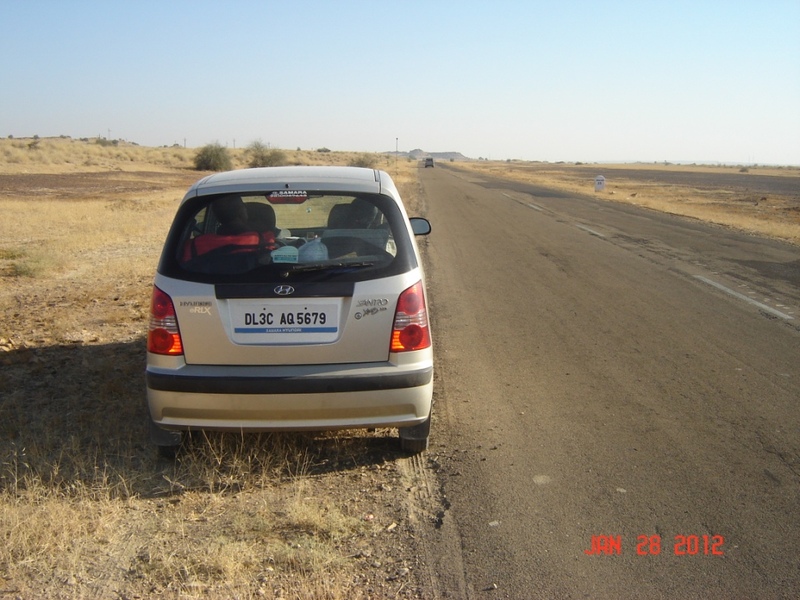 A setback to the ones (me and my son) who were dying for an adventurous road journey. Ultimately, we planned our trip to Ladakh for a week to start on 29th May till 3rd of June 2018. As we wanted to spend maximum time of our trip in Ladakh, we wanted to reach there by direct flight from Delhi. But due to seasonal rush and vacation timing, we could not find direct flights. So we booked our tickets to Leh via Srinagar on 29th morning with departure time from Delhi being 0710 hours, to arrive at Srinagar at 0840 hours. Onward journey from Srinagar was at 1020 hours on the same day. The first jolt or you can say, jor ka jhatka dheerey se, on the previous night of our trip, we received a call from the airlines that our flight for Srinagar had been delayed for three hours. Which meant that it will take off from Delhi at 10.30 am instead of 07.10 am, and the onward fight for Leh would depart on time. With the result, we will miss our flight from Srinagar to Leh on that day and the airline will book us in the next day’s flight. The loss of one day costed us dearly as we had already lesser days in our hands and we were never prepared for that. But we never knew what was there in store for us behind this. The God had planned a pleasure surprise for us and that delay of one day proved to be blessing in disguise for all of us, when we were offered one night stay in a luxurious hotel near Dal Lake with food and transport. Though Srinagar is a much sought after travel destination, disturbance in the valley always deters the tourists to visit there. I had been to Srinagar two times earlier, but Aditi and Anmol (my son and daughter) had never been to this place. I could guess some sort of apprehensions and anxiety on their faces to be at such a place which is mostly in the news always for its untoward state of affairs rather than for its natural beauty. All the apprehensions and anxieties vanished from their minds, when after settling down in our hotel we visited local places, especially Dal Lake in the evening. Why this place is called heaven on earth, was becoming evident when I noticed a feeling of awe on their faces. Timing also favoured us while taking rounds of local Srinaga. A very subtle cool breeze accompanied us while floating on the surface of Dal in a vividly coloured Shikara driven by a saint like sailor who kept quiet all the times while just sailing and perfectly manoeuvring the chappu of the boat negotiating with the winds blowing opposite direction, but he succeeded all the times—thanks to his age old experience we can say. He was not at all interesting in forcibly taking us on-water shopping places and inviting the sellers. Since it was the first visit of my kids to Srinagar and naturally their minds might be full of apprehensions of the danger of Kashmir Valley, I chose to wind up early and tried to reach our hotel safely. The sight of the Dal just opposite of our hotel was not less spectacular. Hence we decided to take a stroll on the road adjacent to Dal Lake enjoying a freedom of moving around in an otherwise terror struck valley. 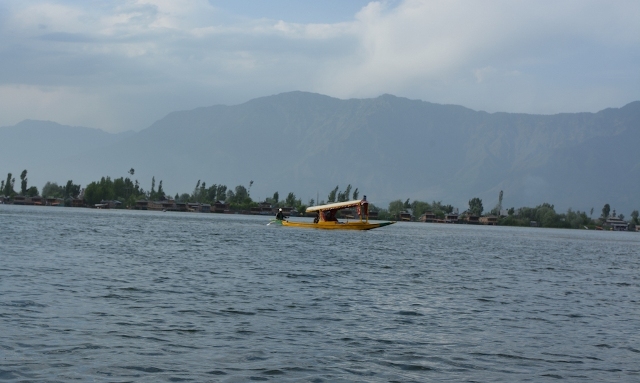 “Shehenshah” was not a lesser attractive place in itself than of any other spectacular sights of Srinagar. We really enjoyed hanging around there taking photographs and posing foolishly. Since the arrival to our dream destination was delayed by one day, but just as we had been compensated for that for having spent a day in Srinagar, we did not mind to wake up early next day and rush to the airport to catch our flight to Leh. it was not as an easy thing to happen—we were asked to report airport at 8 am sharp, and we reached fifteen minutes short 8. To our surprise, the officials of airlines who directed us previous day to reach before 8 were themselves missing from the counter. And we were stranded at the airport cajoling the J&K police personnel and explaining our ordeal. But he refused to budge to allow us to enter. At last, we spotted one official of Air India gossiping at one corner of the airport. We sighed a relief that we have been recognised not as a stranger but as a customer of airlines. He got us allowed to enter the airport. But once we approached the counter, we were again left to a state of suspense by guessing the discussions of airlines staff in their local language, whether we would be able to catch our flight today. After a lot of confusions and tensions, we got our boarding passes, as though we were winning warriors of a battle which was going to loose . We three exchanged a high five. In between of all these tensions and confusions, a very cute little stranger, Taimoor, drew our attention who was flung in a back pack of his mother who was also destined to go to Leh in our flight. 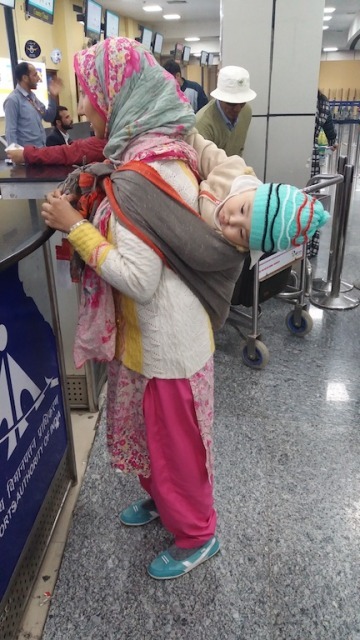 Totally ignorant of travel hassles, he was enjoying a comfortable sleep in his nest, a back pack of his mother. Later he became a good pastime of our short journey to Leh. His mother introduced herself as a Patwari in Leh. Taimoor entertained us with all of his charms and wits. 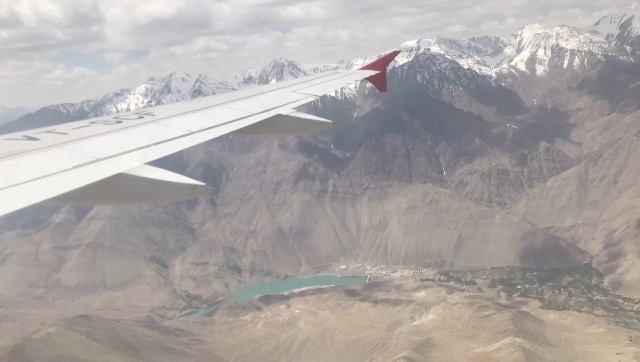 Though Taimoor was an attraction inside the plane, the scene outside the windows was itself not less than any magic or wonder….Snow laden peaks and dunes like mountains…such a spectacular show both sides. (Taimoor inside and wonder outside). The ariel view of the scenic beauty from the window of the airplane, we had forgotten what would be facing us the pre-conditions to visit Leh like lack of oxygen and AMS (altitude mountain sickness) which suddenly erupted to our minds as soon as we landed at the Leh airport. Though there was no atmospheric pressure problems whenever we used to land in other plain cities, yet after just exiting the plane, we tried to feel the difference of altitude pressure. But to our surprise, nothing happened when we came out of the plane and landed on the land of Leh. We felt proud of our bodily resistance not being affected of AMS. The apprehension of AMS just vanished from our minds and we used to think that we are more than normal human beings. And we won’t have to waste our time to acclimatise. We spent our journey time to reach our destination point of stay clicking photos of outside amazing world. We were advised to take full rest in the remaining time of the day, which we thought was a wasteful suggestion. But immediately after taking our breakfast and having a small nap, we realised our body is a burden on us, with reeling head and dizzy mood. Soon we realised the impact of AMS, tired, exhausted and short of breath. There was also a deviation in our blood pressures either low or high. We were advised to take precautions taking medicine and keep ourself well dehydrated sipping warm water every now and then which we followed sincerely. There was every arrangement of taking well care of us, like the good supply of nutritious food and fruits at all times. A sense of VIP like motherly treatment bestowed upon us, keeping track of all small to big requirements prevailed during our entire period of stay, where and when to go places and what precautions to take, sincere thanks to our host which would otherwise have not been possible for an ordinary visitor. In the late evening after taking our dinner, we were allowed to hang around nearby our place of stay. We were attracted to a tall well built structure nearby which seemed to be a depiction of Ladakhi folk story. A mystic breeze of air fluttering the traditional flags of Bodh tradition drew our attention and we spent a good amount of time being there. With that ended the first day of our stay i.e. 29th of May 2018. The next morning when we were amidst of confusion that when and where to go and what to see in our ensuing days, our honourable host cleared the clouds of doubt in our minds and fixing our schedule of visit. We would start our day after having a lavish breakfast, listing the Hall of Fame, followed by a visit to Shanti Stupa and Zoravar Fort. We will be back to our place of stay after visiting Leh local market. With this schedule of our visit, we started our journey to see the Hall of Fame. To be precise and short here, I am indicating the name of websites where you can see the details. 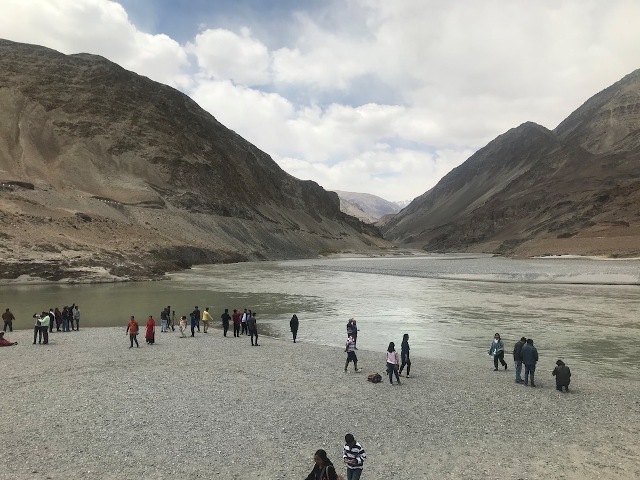 After visiting the fort, we proceeded to Sangam Valley which is 50 km from Leh where two rivers, Indus and Zanskar are meeting. It was really a world away from world. The colours of the two rivers can be distinctly seen at the meeting point. It is an amazing place to sit, relax, and enjoy a picnic. 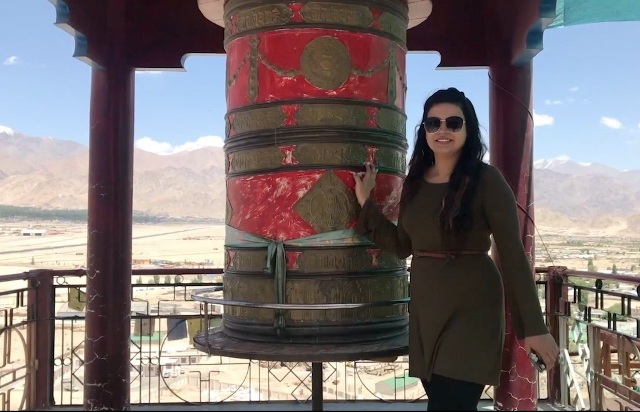 Kali Mata Mandir is such a mystic place at a great height from where you can have a panoramic view of the valley overlooking the Leh airport strip which is otherwise banned to be photographed. If the time permits, one can spend a full day there just gazing at the art of the nature. A big size spin wheel Om Mani Padme Hun was also installed there to pray. 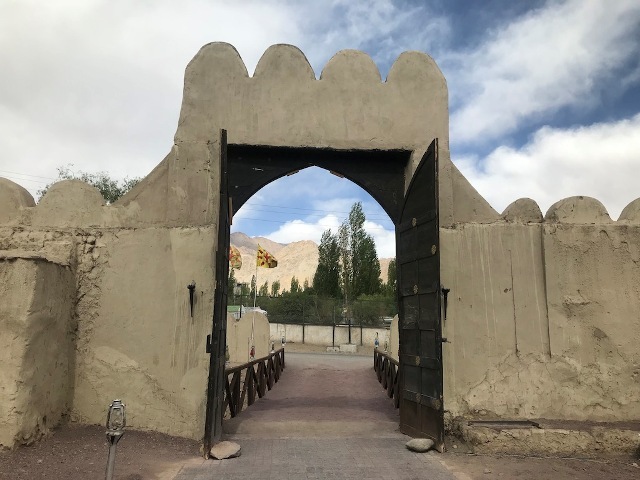 In the early evening, we were destined to visit Hemis Gompa and Kharu Valley where we were told to also see double-humped camels there who had assembled there for some specific purpose. After crossing a long way covering empty fields, kutcha pucca road for about one hour, we reached Hemis Gompa, a highly sacred place of importance for Buddhists. A different kind of calm and serenity prevailed there, only few sounds of Bodh mantras and glimpse of few young and old lamas. On the way back, we spotted few young monks playing outside a monastery who became quite jubilant to see us passing by and we did not forget to exchange Julley with them. Now, we were entering the valley of Kharu situated on the banks of Indus river. The virgin river was accompanying us almost on all the routes either on left or right of sometimes flowing out of sight but nearby with its chiming sound and wild gait. At Kharu, we spent some time with the naughty but innocent double humped camels. As the dawn was not too far, on our way back to home at Leh, we were lucky enough to visit the house of a local resident of Thipsey. We were enthralled to spend some time there drinking Ladakhi butter tea and coffee in a traditionally built Ladakhi house. The drawing room was aesthetically decorated with Ladakhi style with a courtyard having a background of snow peaked mountains. Who would want to go away from such a dreamy abode, but we. Because after all we didn’t belong to that place. At last, the day of main attraction of Ladakh, yes of course, the Pangong Lake, arrived. Excitement was at all its peak, but you have to pay a price for that, the price of waking up early next day morning. The night before was spent with the fear of failing to rise early next day. Thank God to our fauji type training during our stay at Leh, we were ready 15 minutes before the time of departure for the journey for the extreme point of our visit. Though the road upto Kharu was familiar to us, as the same of our previous day’s visit to Hemis Gompa, which was not a tough one. But the road beyond Kharu was a real test of our patience of sitting in the vehicle for a long span of time that is five hours of drive. The driver seemed to be very experienced and matured but the curves on the raw route most of the journey could not deter our decision to witness the amazing sight of Pangong. 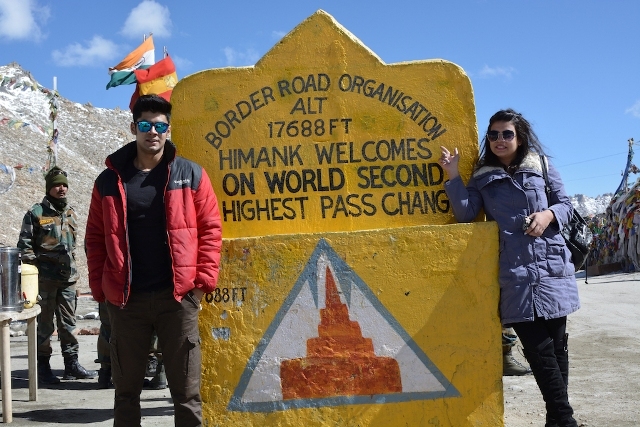 As we were fast approaching the second highest motorable road in the world that is 17688 feet above the sea level, while crossing Chang La, our joy felt no bounds to reach there. The snowy mountains which were playing hide and seek with us throughout our journey were just before us—standing tall, snow white. We did a halt there clicking few photographs and touching the snow converted into ice, crushing below at our feet sounding crackles. 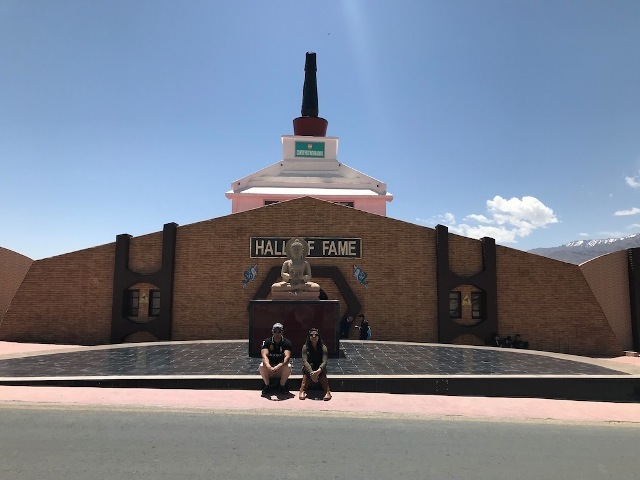 We came to know that it is the second acclimatisation point at Ladakh, if one has to stay ther but we departed from there after spending less than an hour. Journey beyond Chang La was downward but risky and dangerous. Crossing several amusing points like frozen rivers, few small yet beautiful lakes, we entered the region of Pangong. We saw the real cold desert there. Rivers of sand and dunes welcomed us every now and then. Although it was totally a barren land, yet it was looking so beautiful and colourful, which can’t be explained in words and one has to virtually visit it to witness it. The fruit of patience is always sweet. So was the outcome of doing rigorous journey of five hours which we found after reaching our destination, the Pangong Lake. Surrounded by beautiful mountains from all over, we were told it is going towards China. What a serene, calm, pure and a huge blue lagoon was before our eyes. The unruly wind was teasing the surface of the green and blue coloured chilled water. No structure, no heap of garbage, no litter anywhere … I wondered how can our people be so civilised or mannered to keep that place so clean. Brown headed gulls were busy searching their food sometime diving into the lake, sometime flying over or swimming. After catching enormous sweet memories either in camera or in our hearts, we started our backward journey and next day we reached home with a feeling of that some thing we have left behind, with a promise to come back by road as decided at the beginning. 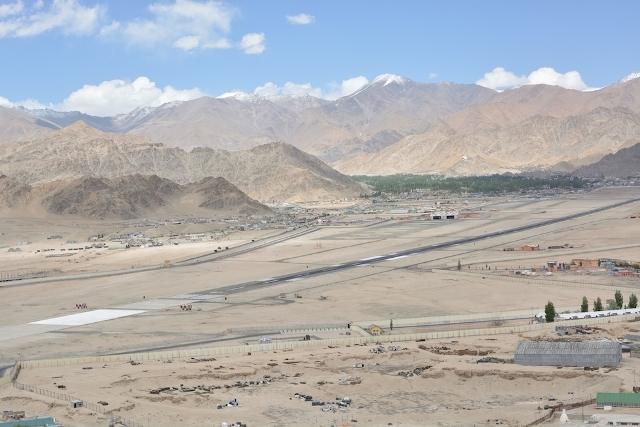 “Julley”, the first word we learnt to utter immediately landing at Leh. Wherever we went and whomsoever we met, we were greeted with Julley. What a warm response we received from either a kid or a grown up person. We use to say Namaste or good morning here in plains but it is not carrying the zeal and warmth as ‘Julley’ in Ladakh. Thank you for starting your Ghumakkari journey… We hope to read more from you! That’s a beautifully written article with lovely pictures. Quite informative as well. Keep writing more and sharing with us..!! 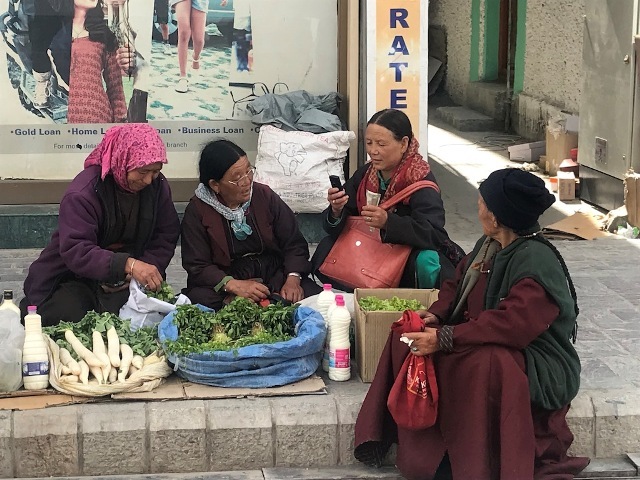 Good account of the Leh trip; great place to be. Timur is really cute. Nice blog and wonderful images! thanks for sharing such interesting blog.